Ever done a Talong na Pinirito or Fried Eggplant that is not soaked in oil? This technique will teach you that you can enjoy a Piniritong Talong that's not very oily. The kind of cooking here is more of pan-frying rather than deep-frying. If you will notice, eggplants are like sponges - they tend to soak up a lot of oil when deep-fried, so I just use a little oil and brush them on the eggplant. Pan-fried eggplants are usually served to complement a main dish. 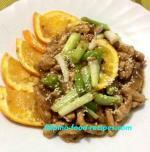 Perfect with Binagoongang Baboy or any fried or broiled fish. I often hear that of all vegetables, eggplants are the least nutritious, and all they give you is fiber -- an absolute misconception! According to The World's Healthiest Food website , aside from dietary fibers, vitamins and minerals, they are brain food and rich in antioxidant compound. They're also good for cardiovascular health and for free radical protection. 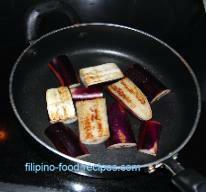 Around here in NJ, the kind we Filipinos cook back home is called Japanese Eggplant. It's distinguishable from the Italian kind wherein the latter is bigger, much fatter, and needs longer cooking time. 1 Brush the eggplant with oil, then season with salt and pepper sparingly. 2 Heat up the pan on medium(use a Teflon pan if available), put the remaining tablespoon oil on the pan to coat it. 3 Put the eggplants in, cut side down first and leave it for 3-4 minutes or until golden brown. 4 Flip to cook other side. If it's soft and no resistance to the touch, it should be ready. 5 Serve as it is or with a lemon/soy sauce dip.